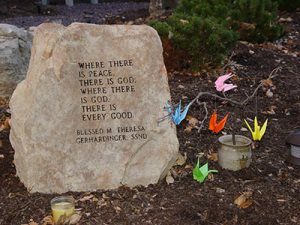 As educators with a global vision, the School Sisters of Notre Dame strive to create a global community where human dignity is respected, all creation is treasured, spirituality is nourished and justice is accomplished. In other words, we commit ourselves to promote the culture of life. We actively work to enhance just structures that foster fullness of life and to change unjust structures that inhibit it. 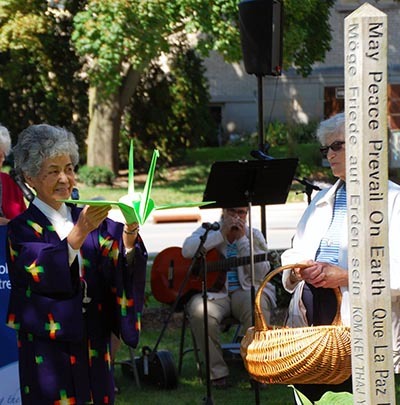 Shalom is the term we use to describe our SSND international network for justice, peace, and integrity of creation. Shalom is the Hebrew word for peace and implies restoring all things to their right order or original integrity. More than 2,500 sisters, associates, and friends of SSND across five continents make up the Shalom Network. collaboration with ecological movements to safeguard Earth. 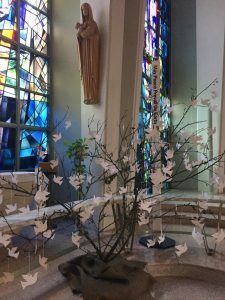 The School Sisters of Notre Dame also work on making a difference at the United Nations through our involvement as a Non-Governmental Organization (NGO) and participating in the United Nations meetings and activities, such as the U.N. Commission on the Status of Women. The 2015-18 Shalom Commitments (PDF). Sister Mary Maher’s address to the July 2015 Shalom Seminar (PDF). Each voice makes a difference. Together, we can make the world a better and more just place. Consider joining us in our efforts to affect positive change!